An exhilarating, energetic, eclectic melting pot, New York is a truly cosmopolitan city, where every language is spoken, every race represented and every cuisine is on the menu. And the best Manhattan hotels reflect that variety. As you'd expect in such a vibrant place, the best Manhattan hotels come with a vastly varied price list. 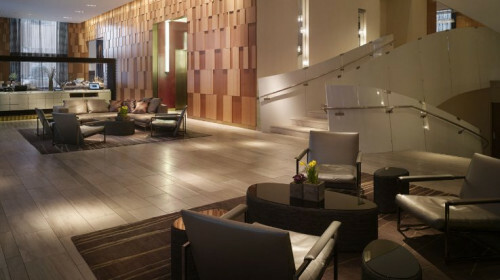 But there’s really nowhere like Downtown Manhattan to experience, and the only way to experience New York is in one of our Guru’s recommendations for the best Manhattan hotels. 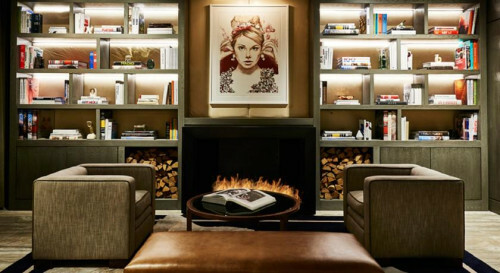 The Gramercy Park Hotel is a luxurious boutique hotel right by Gramercy Park, with an award winning roof terrace restaurant overlooking the park and an impressive art collection which includes Warhol and Damien Hirst. The Mercer is another New York classic, offering the ultimate in SoHo design chic and a world-class restaurant. 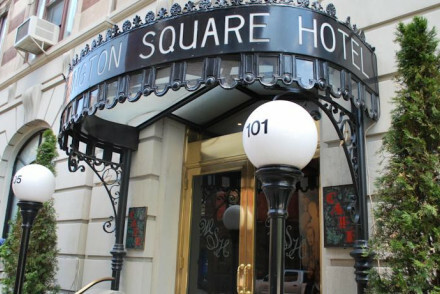 The Washington Square Hotel is a historic hotel in Greenwich village, with Art Deco details, subtly lit rooms and a great restaurant. 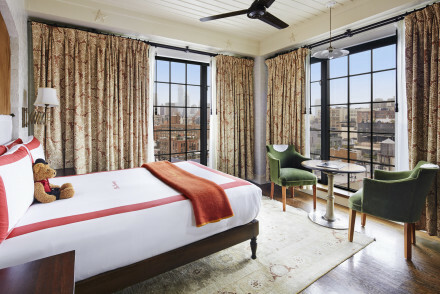 But the SoHo Grand Hotel is a more sumptuous option with stunning views, renowned decor and acclaimed cuisine. 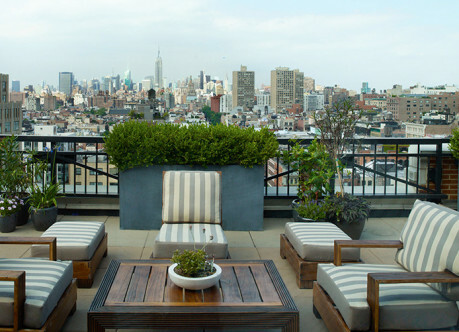 or try Soho House, for exclusive luxury in the Meatpacking district with an even more fantastic rooftop terrace and pool, a deluxe spa and a 44-seat cinema. or you could go for the The Standard in the uber cool Meatpacking District, with it’s ceiling to floor windows offering views across the whole buzzing scene. The Tribeca Grand is another of our buzziest and best Manhattan hotels with an in-house cinema, funky roof-top terrace, regular live music and plenty of luxury. The Andaz Wall Street is worth a mention as the only hotel with a Wall Street address. It’s hip and happening and has a fantastic spa and bar. Newly decorated luxury boutique. Great pieces of furniture and diverse artworks, from Warhol to Damien Hirst, provide a unique impression of 21st century Bohemia. A lively and hip destination. 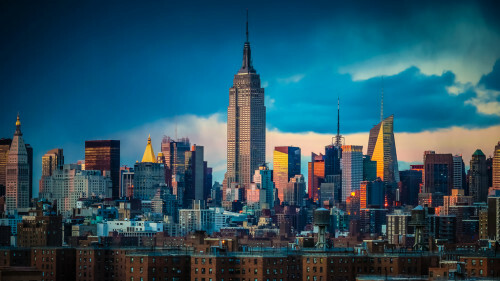 Sights nearby - Just a short stroll away you will find New Yorks most famous site, The Empire State Building. Great walks - Take a turn around the lovely Gramercy Park literally on the hotels doorstep. 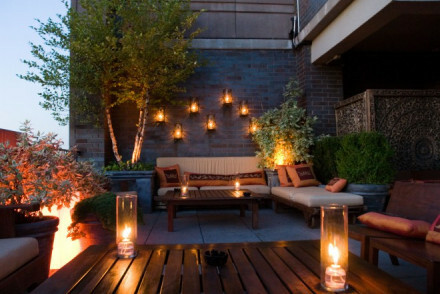 A young, hip and delightfully atmospheric hotel in the trendy East Village. Chic and comfortable rooms with large windows providing plenty of light and splendid views. The vintage bars and restaurants are full of old world charm. A fun and lively destination in an up and coming district. Close to nightlife - Bowery Ballroom and Mercury Lounge are just 800m away, as well as a whole range of hip bars and clubs. Local exploring - This trendy district is full of exciting sites and areas to explore by foot or by bike. Lively - More for revelry than for pampering. Great walks - The hip and trendy East Village is best explored on foot, wander the streets or ask at reception for a good route! Ultimate SoHo chic. An iconic hotel, The Mercer provides the comforts of a home away from home, but in the surroundings of a trendy loft space. Artistic cool and modernist designs. Its world-class restaurant is a must. Foodies - The automatic table reservation at chef Jean-Georges Vongerichten’s Mercer Kitchen is worth its weight in gold. Families - Interconnecting family suites and babysitting services. 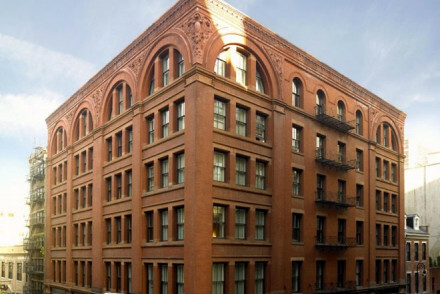 Outstanding location - Located in bustling downtown Soho. Local markets - Walk to the south-east of the hotel and you'll stumble across Little Italy and Chinatown, both well worth a visit. 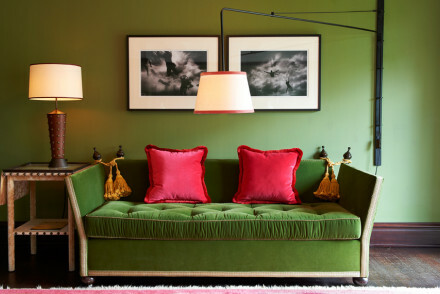 A hip and stylish SoHo hotel. 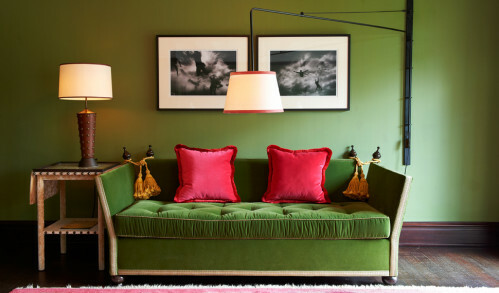 The chic rooms are full of individual details such artworks by Harland Miller and selected literature. Phenomenal bar and restaurant are incentive enough to stay here. A lively spot to see and be seen. Restaurant - Acclaimed restaurant - a paean to Thai cuisine. Great walks - Learn about the Lower East Side’s rich immigrant history on foot during a guided tour at the Tenement Museum on Orchard Street. Local markets - Wander down to Chinatown, under two Km away, and check out all this dynamic area has to offer. An historic 1902 residence turned hotel in Greenwich Village. Art-deco style furnishings and dark mahoganies make up the subtly lit rooms. Here it's all about the prime location right on the corner of Washington Square Park. Local exploring - Right in Greenwich Village, this is an ideal spot for exploring Manhattan by foot. Local markets - Check out the streets of China Town, packed with stalls and shops of every description. Sights nearby - All within a few minutes walk are Madison Square Gardens and Little Italy. Outstanding location - On the edge of Washington Square Park. 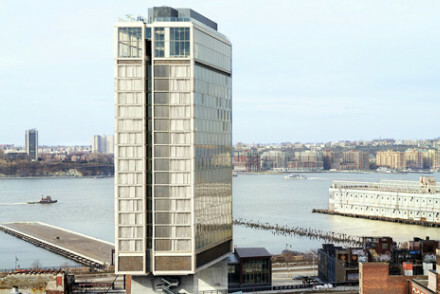 Exclusive luxury in lower Manhattan's hip Meatpacking district. Fantastic rooftop terrace with pool, 44-seater cinema, and delux spa. Soho House is the epitome of cool. What more could you want from a trendy trip to NYC. Enjoy the Soho House restaurant, bar and Cowshed spa. Bar - Rooftop bar situated near rooftop pool. 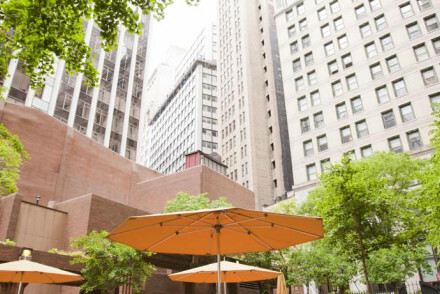 The only hotel with an address on Wall Street, placing it at the epicenter of the Financial District. Large loft style rooms with seriously luxurious bathrooms. A hip restaurant using farm fresh produce, trendy bar and a glorious spa. A boutique hotel with a chains knowledge. Romantic Break - A stylish choice- loft-style rooms featuring pillow menus and king sized beds and downstairs a hip bar and yummy restaurant. 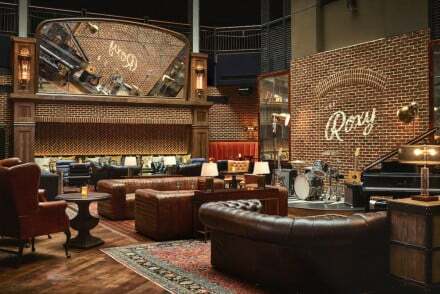 City Style - A slick hotel set in an historic NYC neighborhood- trendy rough brick walls mixed with glossy finishes and lavish fittings. Great walks - Close to New Yorks famous Central Park, a breath of fresh air in the city centre. Sights nearby - Walking distance from ferries to the Statue of Liberty and Governor's Island. 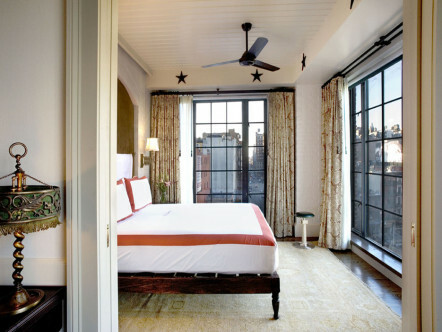 Oh-so chic rooms in the edgy ambient neighbourhood of Lower West Side. Ceiling to floor windows offer stunning views across New York, even from your bath tub. Hip all American food at the hotel restaurant and a 'to be seen in' bar. A hyper-modern way to experience New York. Romantic Break - Wonderfully indulgent suites feature romantic stand alone baths with stunning views and downstairs expect wonderful cuisine. City Style - A super trendy creation by Andre Balazs- achingly hip and housing one of New York's most sought after nightlife spots. 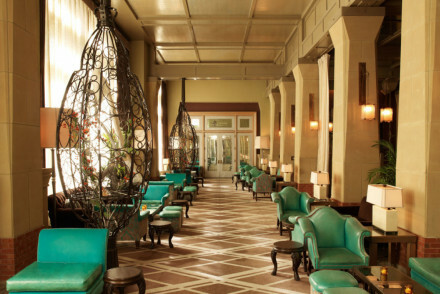 Sumptuous and elegantly designed - the 1870’s Gilded Age meets 1970's luxury - catering to the ultra-chic New Yorker. Rooms have stunning views and are decorated with original artworks. Acclaimed cuisine, stylish bar and sophisticated club room. A chic urban paradise. 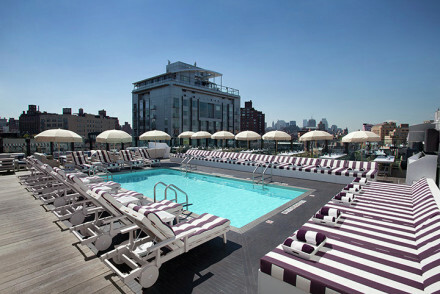 The SoHo Grand’s cooler little sister - the ultimate in downtown chic. The in-house cinema, live music and suave roof top terrace all attract a fashionista crowd. Sleek, mid-century modern rooms, fitted with the latest technology. The relaxing Aire Ancient Baths are located just one block away.